Why Is Customized Security Training Vital? “Security”. When people hear that word a lot of different things come to mind. Some may picture a muscle-bound bouncer at a nightclub. Others may think of a guy in some isolated shack. The truth is, security has changed. While security officers serve as a deterrent and are responsible to observe and report suspicious and criminal behavior, the modern security officer does much more. Security officers are friendly & service focused. In an emergency situation, security officers work to help ensure the safety of tenants and the protection of property. Training is essential, and security offices need more than the state-mandated training needed to obtain a guard card. That’s a bare-minimum qualification. 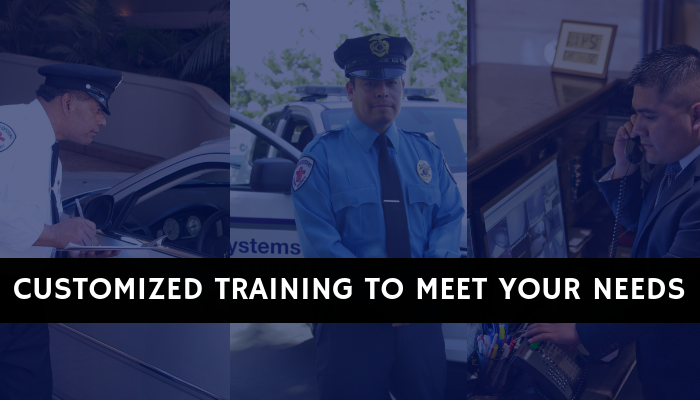 To provide security services that are customized to the needs of each client, it is vital to include training that covers specific scenario-based interactions that occur as officers carry out their day-to-day responsibilities. For example, if an intrusion alarm sounds, in some cases security personnel is expected to immediately call the police and property management and wait till they arrive. In other cases, they may be expected to investigate first to determine the cause of the alarm. Fire emergencies can be another example. Security personnel may need to visually confirm a fire outbreak before activating an alarm. Officers also need to understand what is expected of them in regards to the tenants. Are they to assist with the evacuation of the premises, including crowd control, and provide direction to emergency personnel when they arrive? What about daily interactions with guests and tenants? Are they required to offer personalized services to tenants? What do they do if someone seems unreasonable or becomes irate? It is important for security personnel to know what the boundaries are and what property management expects of them. A properly trained officer should leave a favorable impression on the people they interact with. The reality of today’s digital age is that one poorly handled incident can be easily captured on video and can result in huge liabilities. At GSI we consult with management teams to customize a training curriculum that is designed to give on-site security personnel the understanding they need to work in-line with property management’s requirements for each specific property. These training courses cover various roles and duties of professional security personnel. The training features scenario-based interactions and videos that are in accordance with the officer’s day-to-day responsibilities. Completing these courses are a requirement for our officers and they are tested on their understanding and retention. We have found that these customized training programs make life easier for managers because it helps them prevent unnecessary issues. Instead of fighting fires, managers are able to spend their time and energy focusing on their jobs. http://guardsystemsinc.com/wp-content/uploads/2019/01/customizedtraining.png 400 700 GSI /wp-content/uploads/2016/08/Guard-SystemsLogo.png GSI2019-01-29 21:21:282019-01-29 21:21:30Why Is Customized Security Training Vital? Stay Safe During A Wet Winter Why Is Teamwork Required To Keep Tenants Safe?